So, you have to knock the price way, way down to get your home sold? Not always. While price is certainly important when it comes to getting your home sold, it’s not the only way to achieve a successful sale. Ever heard of a buy-down? Lots of people have, but not everyone understands it. It’s not as complicated as you might think. A buy-down could be the ticket to getting a home sold in a deal that’s better for the seller and the buyer. K. C. Haririan, a Loan Officer with First Federal Mortgage in Birmingham, is here to explain how buy-downs work. 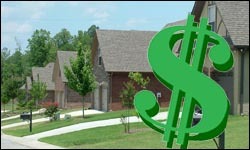 So, how is the Shelby Co. and Birmingham home market looking as we forge ahead into 2009? We’ll share our thoughts and observations–and we’ll see if Fisbo, our very spoiled five pound poodle, barks during our recording session. We hope you enjoy the netcast! Bottom line: There are still lots of choices!